The consent of the Overseas Investment Office is required for transactions involving sensitive land. The information on this page relates to sensitive land that is not residential. A transaction will require consent if it results in an “overseas investment in sensitive land”. The definition of sensitive land is complex with the legislation defining sensitive land by several different types of land, each with an area threshold. Consent is only required if you are an “overseas person” as defined under the Overseas Investment Act 2005. For details, see Do I need consent to invest in New Zealand? or consult a lawyer with significant experience in overseas investments. Section 10 of the Overseas Investment Act 2005 states that a transaction requires consent if it will result in an overseas investment in sensitive land. Overseas investments in sensitive land are defined in section 12 of the Act. The two tables that list the types of land and area thresholds for sensitive land are found in Part 1 of Schedule 1 in the Act. Section 16(1)(a), 16(1)(c), 16(1)(f), and 16(2) set out the criteria for consent for overseas investments in sensitive land that is not residential. Non-residential sensitive land is determined by the types of land and area thresholds detailed in the legislation. While determining non-residential sensitive land is sometimes straightforward, often significant legal and land expertise is required, particularly if there are any nearby waterways. In short, non-residential sensitive land includes land of a particular type, such as farm land, that exceeds a particular area threshold. For example, five hectares of farm land is considered sensitive land, but three hectares of the same land is not. Land is also sensitive if it adjoins land of a particular type and exceeds an area threshold. For example, three hectares of farm land would be considered sensitive if it adjoined a recreation reserve on the edge of a lake. An interest in sensitive land is a freehold estate or a lease, or any other interest, for a term of 3 years or more, including rights of renewal, and is not an exempted interest. See section 12 of the Act for the full definition of sensitive land. Use the flowchart diagrams in Annex 1 below. You will need to read and understand the legislation to determine if non-residential land is sensitive. If in any doubt, the OIO strongly recommends that you consult a lawyer (or other land professional) with significant experience in overseas investments. Please note that the OIO is not mandated to provide legal advice. While there are a limited number of circumstances in which the OIO may be willing to offer advice (in cases of extreme difficulty or uncertainty, for example), the responsibility remains with the applicant. In cases of genuine doubt, the only safe approach is to seek consent. identifying cultural sites, historic places and conservation land. The second table in Part 1 of Schedule 1 includes a reference to the regulator’s (the OIO) list of additional properties (PDF 38KB) (attachment below) for which the adjoining land is sensitive. the transaction will, or is likely to, benefit New Zealand (and in some cases, that benefit is substantial and identifiable). Special land and farm land also have specific consent criteria (see below). Generally, the four core criteria of overseas investments are good character, business acumen, financial commitment and absence of ineligible individual(s) for visas or entry permissions under the Immigration Act 2009. Collectively these are referred to as the investor test. See the OIO resource investor test. Benefit to New Zealand is measured against a large number of economic and conservation factors listed in section 17 of the Act. If the relevant land includes non-urban land that exceeds five hectares (either alone or with associated land), the relevant Ministers or the regulator must determine that the benefit will or is likely to be “substantial and identifiable”. See benefit to New Zealand for more information about the OIO’s approach to the factors. The offer back of special land is one of the factors under section 17 used to assess if an overseas investment in sensitive land will or is likely to benefit New Zealand. Where applicable, special land (qualifying foreshore, seabed, riverbed or lakebed) must be offered back to the Crown and the Crown must decide whether to accept the offer. For information about special land and the offer back procedure, see offer back of special land. Farm land must be offered for acquisition on the open market before consent can be granted. The Regulations establish the minimum standards for advertising farm land. Obtaining a sensitive land certificate can help you to assess whether non-residential land is sensitive under the Act. We also require a certificate containing the details of the land involved in any transaction where an application is made, including whether or not you consider the land is sensitive. Who can produce a certificate? A number of larger law firms along with LINZ accredited Crown property service providers may also have the knowledge required to produce a certificate. You can download the Certificate for the purposes of Schedule 1 of the Overseas Investment Act 2005 (DOT 79KB). 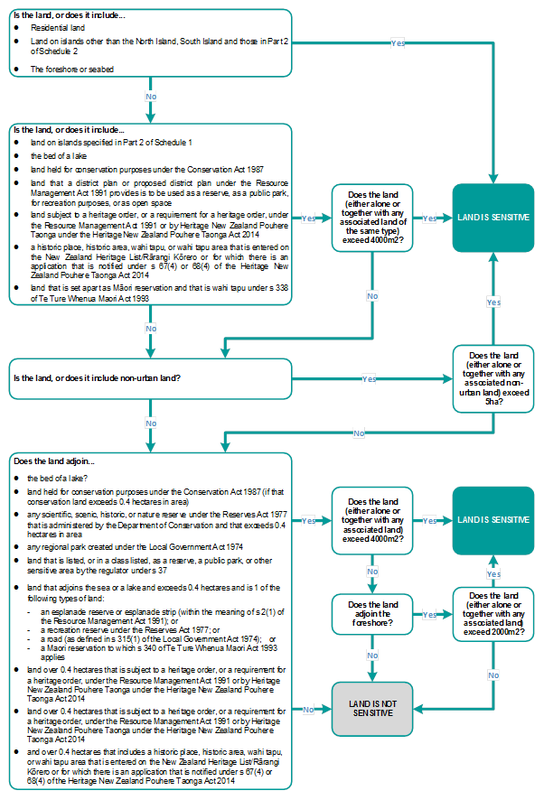 This template has been updated to include land sensitivities inserted by the Overseas Investment Amendment Act 2018, which take effect on and from 22 October 2018. The Minister of Finance and the Minister for Land Information have delegated to the regulator (the OIO) many of the powers to grant consent under the Act. In these delegated cases, the regulator fees apply. the substantial and identifiable benefits criterion (section 16A(1)(b)) applies. the only ‘sensitivity’ is that the land is non-urban and more than five hectares. These diagrams and tables illustrate the methods for determining sensitive land. Non-residential land is sensitive if it is or includes a type of land listed in Table 1 and that type exceeds the area threshold.